General Characteristics: Medium in height to tall, moderately spreading, maturing within 8 to 10 months, producing from 5 to 10 oha; recognized by the dark reddish-purple petioles, inconspicuously striped with lighter color, with bright reddish edges. Petiole: 75 to 100 cm. long, dark reddish-purple shading to purplish-lilac on upper third, inconspicuously striped with lighter color, distinctly bright reddish at edge, a purple ring at base with narrow, bright red area for 2 to 4 cm. above. Leaf blade: 35 to 45 cm. long, 25 to 35 cm. wide, 25 to 35 cm. from tip to base of sinus, ovate, dark glossy green with bluish cast; piko conspicuous, purple; veins bright reddish on lower surface; lobes obtuse, undulate on margins, with narrow sinus. Corm: Flesh white with pinkish apex, the fibers yellowish; skin brilliant lilac-pink, often dark purple along leaf-scar rings. Origin, and derivation of name: Native variety; poni, meaning "purple," refers to the petiole coloring. 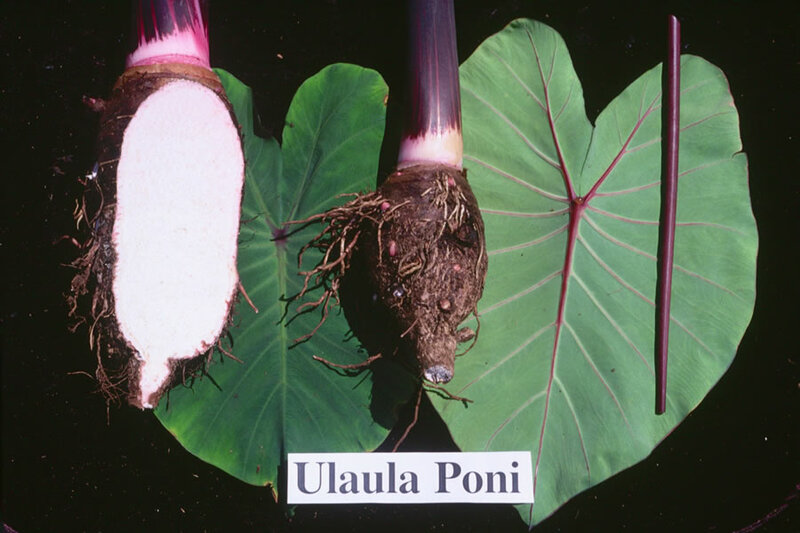 Distribution: Often found associated with the other Ulaula, usually in the uplands. Use: Occasionatly as a table taro; in early times a purple pigment was extracted from the petioles and used by the natives for dyeing tapa, straw hats, etc.